Behind every well traveled mile, there is a well used blade. The best backpacking knife isn’t an accessory, it’s a part of the pack. 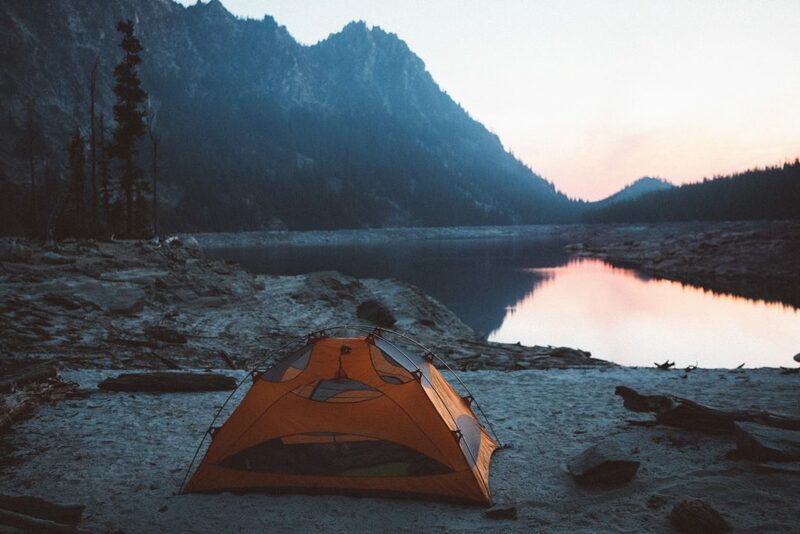 Whether you spend summers camping out of your car or are a four season backpacker, there’s one piece of gear that is universal to the trade—a reliable pocket knife. Choosing the best backpacking knife that suits your needs is a must. Whether that means fast and light or sturdy and serious depends on how you travel and what chores you tend to take into the woods with you. Some companies like Ka-Bar Knives and Buck Knives have been making knives for over a hundred years. Other companies are new to the game. Each has something unique to offer. Because just like other gear, the backpacking knife has evolved quite a bit in recent decades. Although most kids have been distracted by new cell phones and video games, technology has had a lot more to offer than just tech. Steel has made great strides and is now folded and formed into new alloys that are stronger and more corrosion resistant than old school steel. Not only steel but edge technology has come a long ways too. An out of the box Spyderco pocket knife edge may be among the sharpest steel the world has ever seen. If you want to get really into it, different knives are made with different grind patterns that affect how they cut and retain their edge. It’s pretty technical stuff that we won’t get into here though. It’s not just the materials that are more advanced than ever. The mechanisms on the best backpacking knives these days are state of the art. From spring loaded and ball bearing assisted opening to various forms of locks and releases, each company is pushing the limits. You’ll read all about the specifics of each brand’s bells and whistles in a minute. What you really need to consider right now is what you need from your own best backpacking knife. Do you want a small, simple blade that’s durable and lightweight? Do you want a beast that can hack through just about anything? 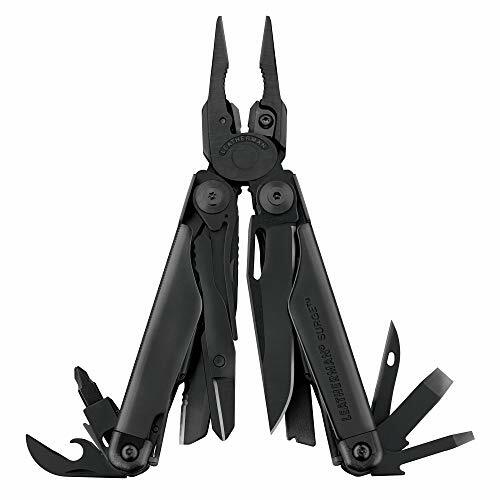 Or are you looking for a master-of-all multi-tool? Each will have trade offs in weight, versatility, longevity, and functionality. There’s a lot to consider. That’s why we’ve pulled out all the stops. We figured, with a tool this essential to the backpacking arsenal, we couldn’t cut any corners. So today we’ve reviewed over twenty of the best backpacking knives and multi-tools for camping and travel. This is no quick dip into the world of knives. This is the full dive. The top 23 picks for the best backpacking knife are coming up. Then, we’ll look into everything it takes to make, find, and care for a backpacking knife. By the end, you’ll know exactly what blade is right for you. 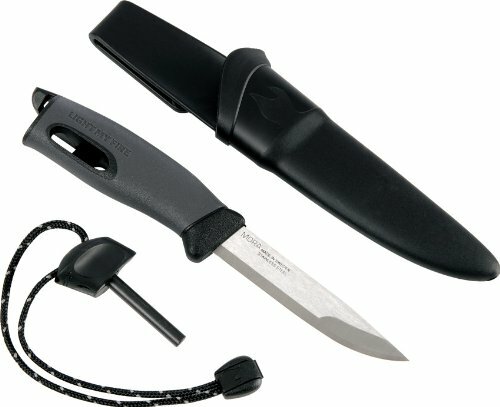 Why Get a Knife for Backpacking & Hiking? What Size Knife Do You Need for Backpacking? Spyderco Delica 4 Blade: 2.875"
Benchmade Griptilian 551 Blade: 3.45"
Benchmade 15031-2 North Fork Blade: 2.97"
Spyderco ParaMilitary 2 Blade: 3.438"
Cold Steel Finn Wolf Blade: 3.5"
Victorinox Classic SD Swiss Army Blade: 1.25"
Benchmade Mini-Barrage 585 Blade: 2.91"
Spyderco Manix 2 Blade: 3.37"
SOG SlimJim XL Blade: 3.18"
Opinel No. 8 Blade: 3.25"
Benchmade Osborne 940 Blade: 3.4"
Cold Steel Voyager Blade: 5.5"
Gerber LST Ultralight Knife Blade: 1.96"
Light My Fire Swedish FireKnife Blade: 3.75"
Based in Golden, CO, Spyderco has been a sharp contender in the knife game since the 80s. The Spyderco Delica 4 is a big part of their legacy. Originally released in 1990, the Delica 4 has always been one of their most popular models. The secret to the success of the Delica 4 is twofold. Most obviously, the Delica 4 is virtually weightless. At 2.5 ounces, it might trick you into thinking that it’s just a flimsy toy. This is one of the lightest EDC knives on the market. That makes it great for taking on long backpacking trips without adding weight to you kit. 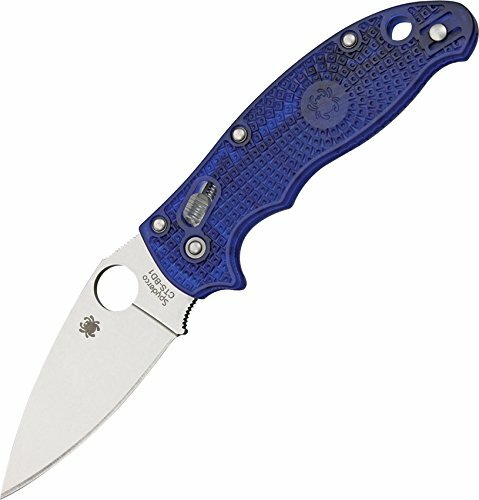 The second thing that makes the Delica 4 one of the best EDC knives is that it is made with quality components to a high standard. This thing is sturdy, and the features are smart. Everything from the signature Spyderco thumb hole, to the four-way adjustable pocket clip make this blade a breeze to use. It just feels right. You can also run a thin chord or wire through the lanyard hole to clip the Delica 4 to your pack or belt. The only downsides here are that it’s so light, you might lose it. Benchmade is a name synonymous with superiority in the world of knives. If you’ve never used a Benchmade knife, then don’t think you’ll find the best backpacking knife until you do. 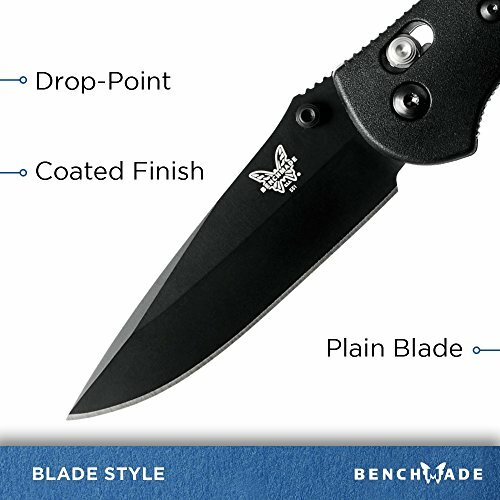 The company’s reputation is the reason that Benchmade knives are sold in stores worldwide. Many outdoors stores carry almost exclusively Benchmade knives because of their high quality and reliable reputation. But don’t let them fool you, you’ll probably get a better price if you buy your blade on Amazon.comAmazon.com. 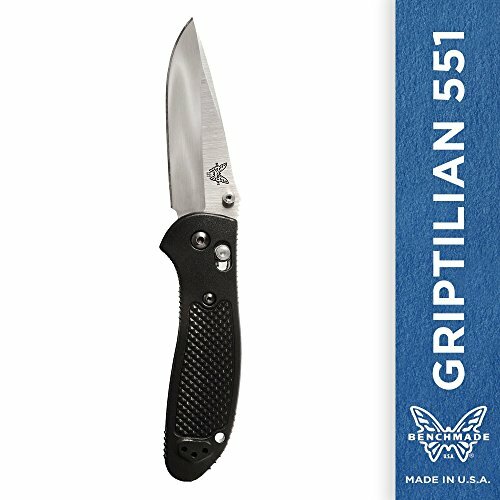 That being said, the price is the one and only downside when it comes to the Benchmade Griptilian 551. However, you get what you pay for, and the Griptilian is by no means the most expensive EDC knife out there. What makes this knife so special is it’s balance of features. It is large for an EDC knife, but light for it’s size. 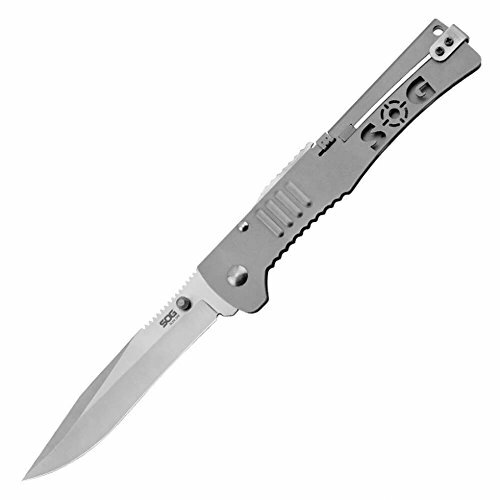 It opens with Benchmade’s signature AXIS locking mechanism. Incredibly smooth. The Griptilian is highly customizable. You can buy it with different blade shapes, edges, and handle materials. Upgrading to a G-10 handle makes the Griptillian a fierce contender for the best EDC knife for backpacking and camping. Although some of Kershaw’s knives are manufactured abroad in China and Japan, the Kershaw Skyline is 100% manufactured in the USA. This knife is small, lightweight, and unobtrusive. Although it’s as light as the lightest EDC knife out there, the Skyline is of the highest quality. The G-10 handle feels especially good. It’s not the biggest handle around, but it sure feels great. The only downside is that the clip is not left-right reversible, although it does allow tip up or tip down carry. 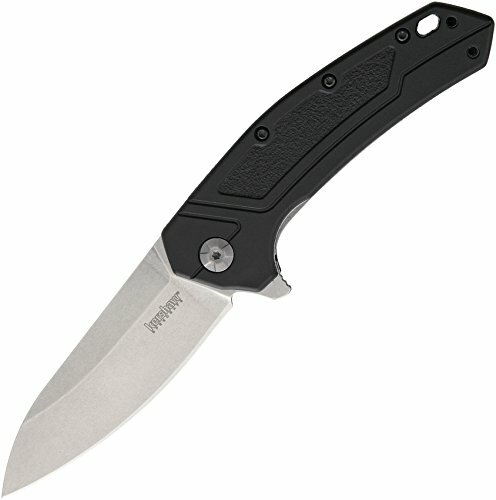 Some would complain about the unassisted opening mechanism on the Kershaw Skyline. However, once you get used to it, it feels more reliable and safe than a lot of other knives’ special mechanisms. This is one of the best knives for travel or backpacking because it is so lightweight and unobtrusive. The North Fork from Benchmade is the first in their knew line of HUNT knives. 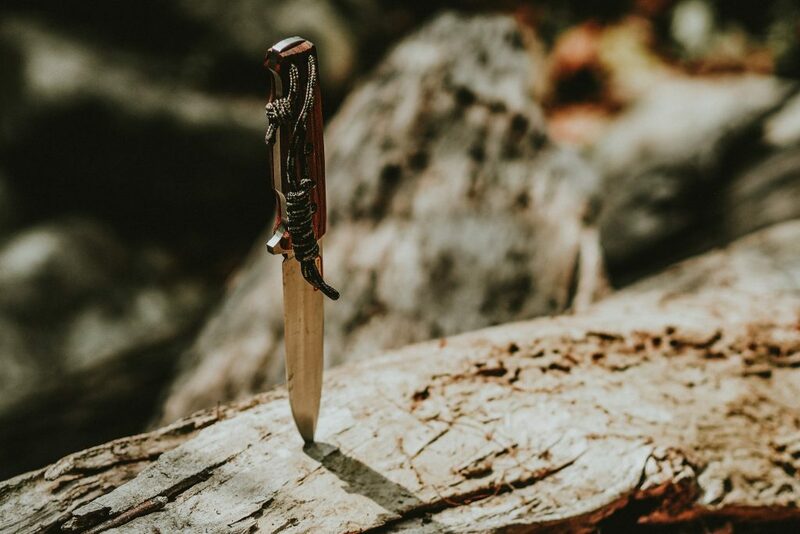 Made from better steel, sturdier components and a higher-quality handle than even Benchmade’s other products, this knife may be the best backpacking knife to take hunting. 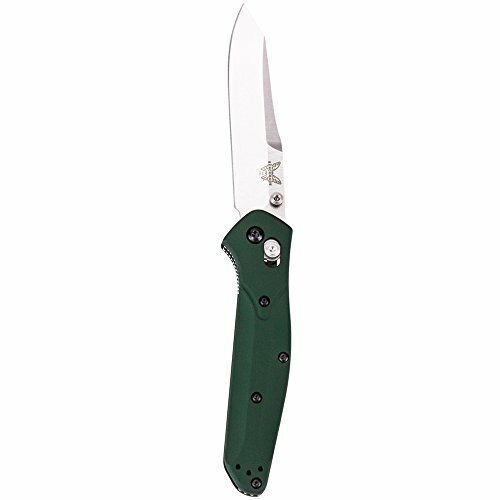 Because this knife was designed for small blade-work while hunting, the blade is ideal for hard work. S30V steel holds an edge through an impressive amount of use and is easily sharpened. The stabilized wood handle is a big draw for this knife. It doesn’t just look incredible, it also feels just as good. If you’re a sucker for good wood over synthetic materials, then this might be your blade. 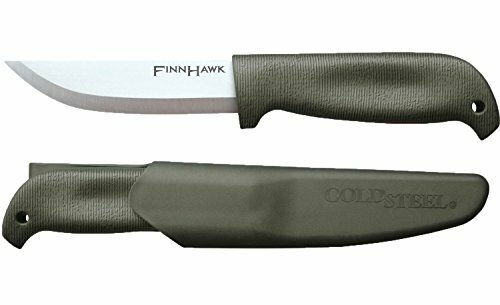 If you intend to use your knife for a lot of whittling, game processing, or other tough work, then this is a great choice for you. It’s not the biggest or the lightest or the cheapest knife. But it may be the best backpacking knife for anyone who also hunts. CRKT, whether they like it or not, is considered by many to be the middle of the line. However, if you read between the lines, you’ll realize why these knives are so popular. Not everyone needs the highest quality steel and ultra-light components to make their best backpacking knife. Some just need a cheap and reliable blade that is easy to use and keep sharp. Enter the CRKT Drifter. It’s super solid and it’s affordable, even for the budget backpacker. Best of all, even though they keep the price low, CRKT uses quality materials which make the Drifter both lightweight and feel great. The pocket clip is not reversible and the opening is unassisted, but to many, this is of little consequence. The CRKT Drifter is the best EDC knife for the budget backpacker or the fast and light traveler. 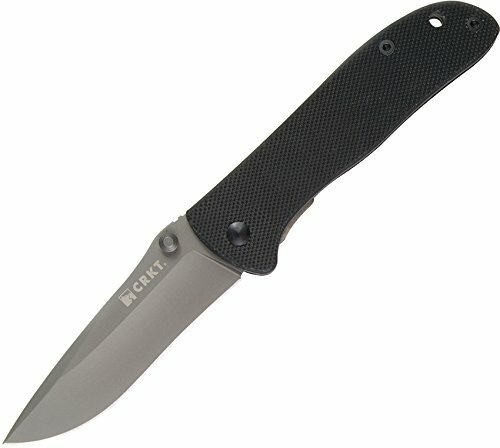 The Ripple is the first knife that Ken Onion designed for CRKT and marked a change in the company’s reputation and direction. Who is this Ken Onion, and why is he so special you ask? Well he’s the youngest knife maker ever inducted into the Blade Magazine hall of fame in 2008. Their opinion of him is no exception. Ken is widely regarded to be one of the most talented knife makers of modern times. 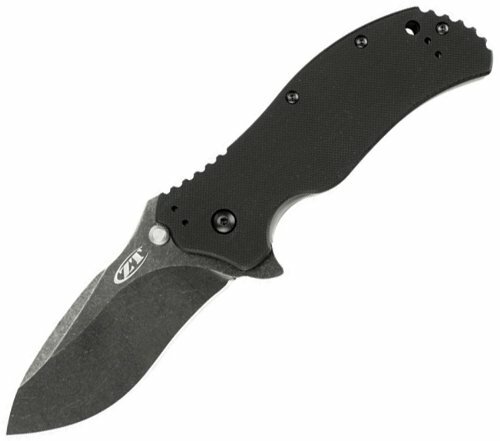 Although he was employed by Kershaw for many years, his recent move to CRKT has sent ripples throughout the knife world, so to speak. The flowing geometry and low-profile design of the Ripple make it strangely beautiful. Don’t be fooled though, this knife is deadly serious and was designed by one of the foremost masters to have the fastest opening of nearly any EDC knife ever made. For the incredible look and quality of this knife, the price is insanely low. If you’re looking for a real work of craftsmanship, then get the CRKT Ripple. Definitely the best backpacking knife for the self defense minded. It is also one of the longest knives in it’s weight-class. The Spyderco ParaMilitary 2 is well known to be one of the highest quality EDC knives out there. It’s not cheap, but it’s just about everything else you could ever imagine. Definitely a contender for the best backpacking EDC knife. 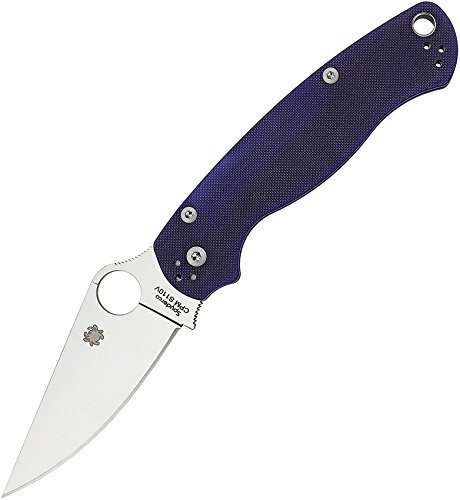 What makes it so special is not just the highest quality materials Spyderco uses to make it. Nor is it the low profile and customizable fit. Not even the fast opening and perfect size. 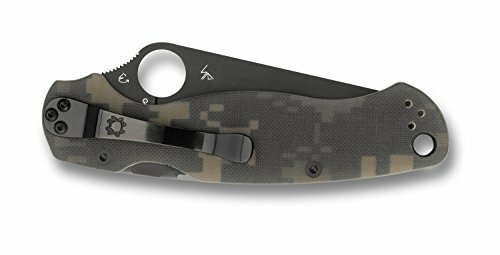 What makes the ParaMilitary 2 possibly the best EDC knife is just the way it feels when you use it. This thing is bombproof. It’s not the lightest EDC knife, and honestly, that makes it feel better. The action feels unnaturally smooth and the design fits most hands perfectly. It’s something you really just have to feel for yourself. If there is a downside to this knife, it’s the price. However, you buy one of these, and unless you lose it, you’ll probably be using it for the rest of your life. 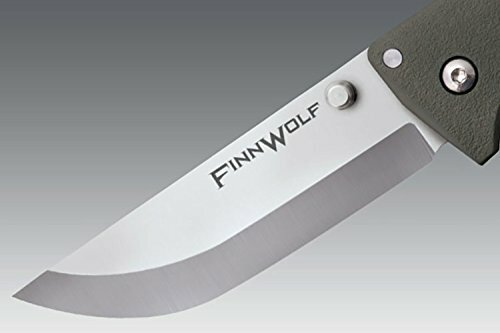 The Cold Steel Finn Wolf is a collaboration between Cold Steel and blade maker Andrew Demko. The result is an affordable, and highly functional folding version of a classic Pukko design. This knife is not bogged down by flashy style or extra features. Just a full-size, lightweight workhorse that just about anyone can afford. Not intended to hide inside your pocket, this knife packs a three and a half inch blade inside of a handle big enough for four of even the fattest fingers. The blade is three millimeters thick and sturdy enough for real camping work. Not some flimsy thing for city folk. Dual thumb studs flip this knife open smoothly and the lock is TRI-AD. If you didn’t know, that’s pretty much as solid as it gets. This knife is no-nonsense. An affordable EDC for the outdoorsman and backpacker. Unless you grew up on another planet, this knife should need no introduction. 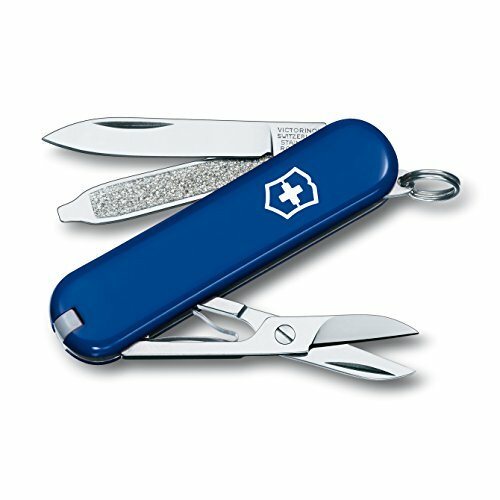 The classic Swiss Army Knife has been an iconic part of the camping kit for decades. This knife is a very different type of tool than most modern EDC knives. Unlike newer knives, the Swiss Army comes with a full load out of tools to tackle all sorts of situations. During the average day in the city, a full Swiss Army Knife is a little excessive. I mean, are you really going to stop and file your nails with the built in nail file? Not likely. However, out in the woods, all those little gadgets can really come in handy. 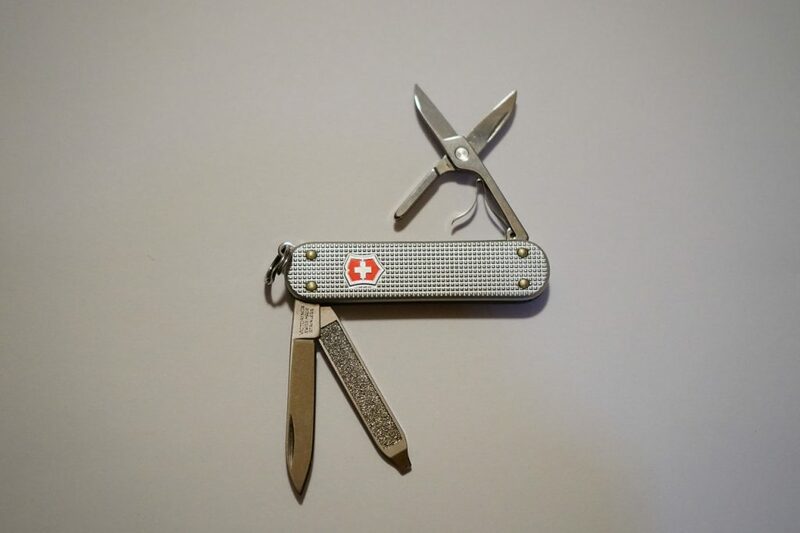 Each Victorinox Classic SD Swiss Army comes complete with a blade, scissors, nail file, 2.5mm screwdriver, toothpick, tweezers, and key ring. All told, this package weighs just 22g, or 0.77 ounces. That’s insanely lightweight. Part of the reason why this knife is so light is because it’s also tiny. By far the smallest knife on this list, it’s the perfect size to hang from your key-chain and forget about. However, that does mean that the blade is also much shorter and narrower than the others reviewed here. It won’t tackle cutting tasks quite as serious. Not the best for splitting kindling or processing meat, but great for small camp tasks and as a replacement for nail clippers, etc. Benchmade makes over seventy three distinct families of knives, several with multiple knives in the family. They know what they’re doing when it comes to knife making. The Mini Barrage 585 is definitely among their higher-quality models. It’s pricepoint reflects the quality of the materials and construction going on here. This knife is not for dipping your toes into EDC. Loaded with assisted opening and Benchmade’s signature AXIS locking mechanism, this knife does great open, closed, as well as in between. Unlike many knives these days, this knife can actually be locked closed as well. However, many people find this annoying as it can be difficult to learn to use the locking mechanism fluidly. 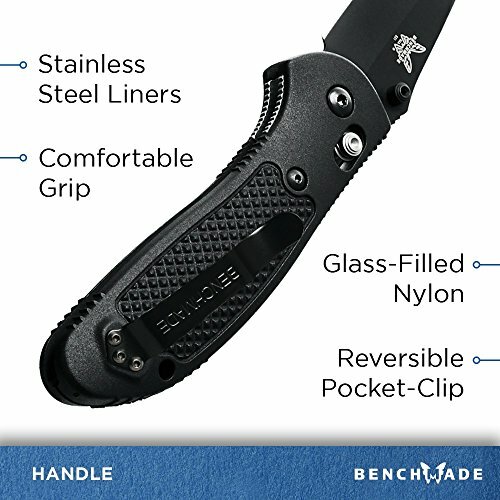 Although there are a lot of features about the Benchmade Mini-Barrage 585 that are great, its the big picture that will win you over. It’s hard to name any one feature that makes it so perfect. But it just is. The blade is big enough to mean business and handle 90% of tasks, the handle fits well in your hands. That’s even though this pocket knife is smaller than most other EDC knives available today. High contender for the best EDC knife for camping and backpacking. Especially if you like smaller blades. 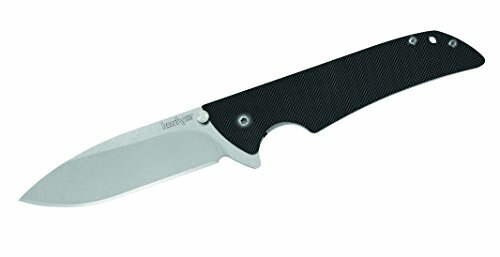 The Kershaw Roveis a great example of a simple knife, made for the budget backpacker. It’s not made from the best steel or the sturdiest composites, but it’s certainly sturdy. The Rove features smart, low profile design features that maximize it’s utility at one of the lowest prices around. Featuring a drop tipped blade similar to many models Kershaw produces, the Rove will feel familiar to anyone who’s used Kershaw steel. Unfortunately, the blade on this one is only made out of 8Cr13MoV steel. If you’re not familiar, it’s a pretty typical steel that is by no means the top of the line. The blade on the Rove comes with a hollow grind and has a smooth action with the assisted flipper. When it’s open, a classic liner lock holds it in place. Simple and reliable. One of the coolest features on the Rove that makes it a good EDC knife for backpacking and camping is the extra large lanyard hole in the handle and the reversible deep-pocket carry clip. This makes it easy to attach to your gear no matter where it fits your kit. This knife won blade magazine’s award for the most innovative American design back in 2010. In the years since then, it’s reputation has only been confirmed as one of the best lightweight EDC knives on the market. Not only is this knife well made, lightweight, and extremely comfy to use, it’s also unique and innovative, and will not feel like other blades you own. That’s in part due to the signature style of Spyderco knives. Featuring a thumb-hole flip mechanism as well as an ergonomic handle and a wide-based, full length blade. Although this knife is one of the lightest knives on the market, it is not flimsy. Even the pocket clip, which is only a wire silhouette, is sturdy and reversible. That’s what this knife is all about, the perfect fit in a featherweight package. 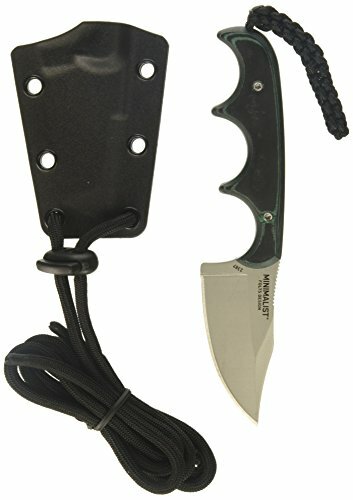 This knife also offers an extra large lanyard hole, making it great for clipping onto your backpack or gear when you’re out in the woods or mountains. This knife is the obvious pick for the best backpacking knife in the featherweight category. If you are the type to count ounces, count on the Spyderco Manix 2 to be your best friend. The SlimJim from SOG is reputed to be the slimmest EDC knife ever made. That may be true. Whether it is or not, the SlimJim is definitely lightweight, low-profile and well built. Built from sturdy components, mostly steel, and crafted in a simple and functional way, this knife feels natural whether it’s open or closed. This knife flips open using SOG assisted technology, or SAT, and locks into place using both primary and secondary locking mechanisms. The secondary safety also serves to keep the blade firm in it’s closed position. This knife is a classic mid-grade blade. It’s not the best on the market, unless it hits a sweet spot in your heart. However, for a moderate price, the SlimJim holds an impressive edge over it’s competitors. The primary complaint you’ll hear about this knife, is of models arriving with flaws out of the box. It’s not common, but it seems like every now and then someone gets one with a sticky hinge or a minor flaw. Very rare, and you could easily return yours if it were to come with such a defect. Ok, stop what you’re doing. Tell whoever’s distracting you to shut up and go away. 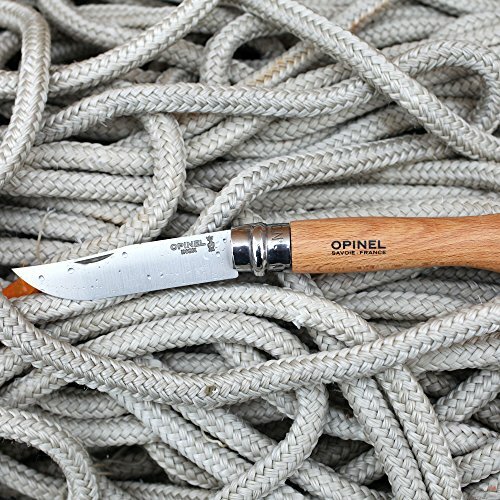 Because whether you’re looking to buy a new EDC camping knife or not, you need to know about the Opinel No. 8. This knife is almost as classic as the Swiss Army Knife, and every bit as useful. Well, let’s be honest, there are no scissors or toothpicks hiding inside this knife, just a three and a quarter inch carbon steel (or stainless) blade. It’s just enough for all your average camping tasks and not too much to be a bother. 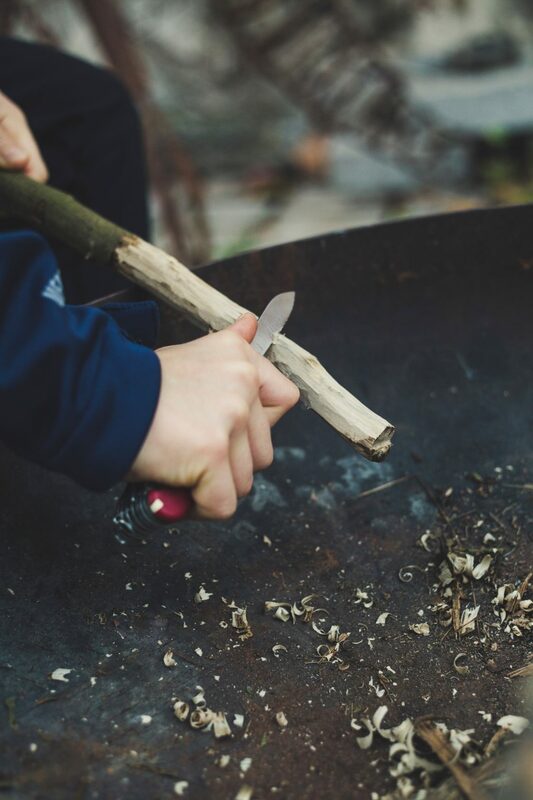 Because of the extra reliable ‘Virobloc‘ locking collar, you can even use this knife to baton-cut kindling (if you’re careful)– a task normally reserved for fixed blade knives. Due to the lightweight wooden handle and simple design, this knife is probably the lightest of it’s length. That’s just one reason why this might be the best backpacking knife for the average adventurer. Other good reasons are it’s insanely cheap price, timeless durability, and enduring style. Seriously, my Opinel No. 8 was my dad’s before he gave it to me. He’s grown too old to go camping. Before him, it lived at a second hand store. Who knows how many years this thing has been on the trails. Still cuts like warm butter. Hinge and lock work perfectly. If you don’t need your knife to be some high tech, new-age affair, but just want affordable utility, then this is the best backpacking knife for you. Hands down. The Benchmade Osborne 940 is definitely one of the highest quality knives in this review. It is also, however, one of the most expensive. The real question is, is it worth it? The easy answer is, if you have the money, then yes, definitely. However, if you’re looking for a budget blade, then keep scrolling. Benchmade pulled out all the stops when it came to constructing the Osborne 940. That means the best steel, world class machining, and all-American manufacturing for reliability and durability. What makes this knife really unique is it’s design. Conceived by knife maker Warren Osborne, this is a great example of what Warren finds most compelling in a quality blade—utility and attention to detail. To keep it functional, this knife is slim. That saves a lot of weight without sacrificing valuable blade length. In fact, the Osborne has both one of the longest blades, as well as the lightest weights of any knife in this review. Don’t worry about it being too small for your hand though. Although the handle is slim, it is a great length to fit well in your palm and has excellent geometry to accommodate a number of grip styles. Definitely the best backpacking knife for anyone ready to pay for the highest quality. 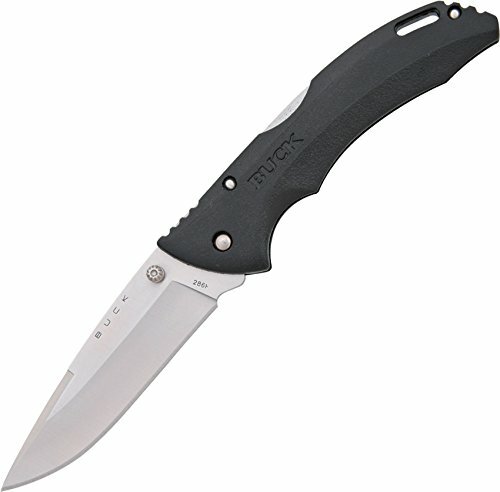 Buck has been one of the most historic and high quality brands of blade for over a century in America. They have been responsible for some of the most timeless models of knives ever known. Although better known for blades of the highest quality with heftier price tags, the Bantam is a departure from their norm. Not to say that the Bantam is a bad knife, it’s just not made from as high quality and expensive materials as most of their other products. In fact, this is one of the cheapest knives in this review. Although the Bantam used to be manufactured in China, it has been American-Made since 2009. It’s simple, elegant design feels familiar and comfortable in your hand. Thumb studded opening and a classic positive locking mechanism will feel natural, although many Bantams are sticky on the slide at first. A bit of oil can help with that. All in all, for the insanely cheap price, this knife is basically a no-brainer. Drop the price of two beers at the club on this affordable camping knife and then use the lanyard hole to tie it to your pack. You can forget all about it for now. Next time you’re out in the woods, you’ll be stoked to be ready for anything. Elegant and simple, this Ka-Bar can take on all your daily tasks. It’s full size makes it great for camping, yet it’s light weight ensures that packing is not a problem. Ka-Bar, much like Buck, has been responsible for some of the most famous knives ever made. Their place in knife making history is certainly secure. The Ka-Bar Dozier is certainly a departure from the USMC fixed blade that made Ka-Bar famous around the world. However, it is equally innovative while still maintaining a signature simplicity. Unlike other low-price EDC knives, this one works just like it should, right out of the box. There’s no sticky action or wiggly joints. It’s not going to wear out after a year of use. Although the Dozier is a pretty long knife when it’s open, the blade is relatively short at just three inches. To some, this feels out of balance, to others, it provides leverage and power along with a comfortable fit in your hand. Whatever you decide, it’s hard to complain when you paid less than $20 for such a quality piece of equipment. The Voyager comes in a variety of blade styles. What you see here is the tanto-tipped straight edge. Right away, you’ll notice that this knife is way bigger than almost every other EDC camping knife out there. That extra length can become a big asset when you’re out in the woods and makes this knife far more versatile than many of the other offerings on this list. And although this knife is large, it is light. Surprisingly so, considering how bulletproof this blade feels. The most advanced lockback technology along with one-handed assisted opening makes the Voyager easy, not just sturdy. This knife isn’t just unique in it’s size, but it’s innovative handle shape is designed to cut back weight, but still fit perfectly in your hand. Plus the textured Griv-Ex scales make for a slip-free fit in your palm and feels great in a number of grips. All in all, this knife is unique, and extremely high-quality. If a bigger blade appeals to you, then look no further than the Cold Steel Voyager. Definitely the best large EDC camping knife out there. The Zero Tolerance 0350 may look discrete, but don’t be fooled. 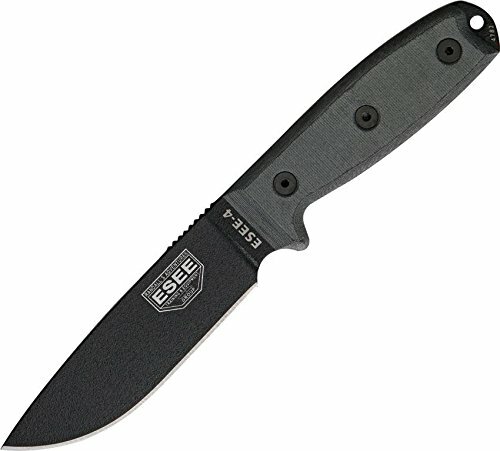 This thing is constructed to the highest standard for doing the hardest work an EDC knife can slice. S30V steel is durable, corrosion resistant and holds an edge beautifully. The opening mechanism is a functional and familiar thumb stud with speed-safe opening and a liner-lock. Functional and reliable. The handle is lined with sleek, black G-10 scales. The deep texture on the handle feels firm and secure. For maximum customization, the pocket clip on this knife is four-way reversible. That means you can switch between tip-up and tip-down as well as left or right-handed carry. You probably already noticed that this knife isn’t even attempting to be the lightest EDC knife out there. In fact, this ZT is pretty darn heavy. Once you hold one, you’ll see why. This blade is not for basic work. It’s built for besting even the most beastly of tasks. It’s extra long, extra strong, and heavy-weight design make it ideal for camping, hunting, and survival uses. You’ll pay a pretty penny to pick one of these up. But you’ll be using it for the rest of your life without a hitch. Seems like a no-brainer. It may seem like standard practice to the now-a-days knife enthusiast, but back when Pete Gerber first envisioned this knife, it was the first ever made with an all-synthetic handle to reduce weight. And oh baby, does this blade know how to drop weight. If this knife weren’t so old and well-reputed, you might worry there was something wrong with it. Honestly, this knife is too light for some people. However, since it comes complete with a featherweight price tag to match, it’s hard to say no to such a historic blade. Nothing extra on this work of art. Just a two inch blade with a liner-lock and sturdy hinge. If you want more than that, you’re going to have to look for a knife that weighs more than an ounce. Seriously, you won’t believe this blade. This knife is another obvious departure from the norm on this list. And as you would expect, the tricks up this one’s sleeve make it especially useful for certain types of travelers. The Light My Fire Swedish FireKnifemay not make a great EDC for your every-day life, but it’s great in the back country. 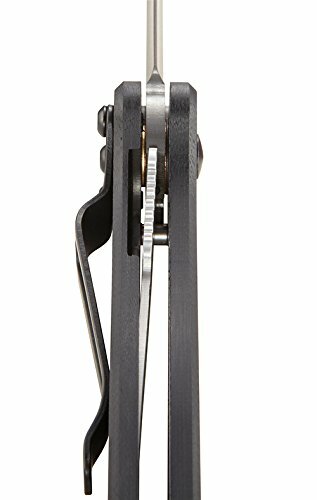 The best camping knife for backpacking and backcountry travel, this blade has a built in fire starter. And we’re not talking about a box of matches. Twist-locked into the ultra-lightweight handle, you’ll find a magnesium flint stick. If you haven’t used one before, you’ll be in for a real treat. Because it’s great to start a fire using matches or a lighter. However, these days, it’s all about using chemistry to help get the fire going on cold and wet nights. You simply use the back of your blade to spark the magnesium fire stick and aim it at your tinder. The resulting sparks will burn at 5,400 degrees Fahrenheit. If that won’t lite your tinder, you’re doing something very wrong. Beyond that unique feature, this knife is what it seems. Not the highest quality blade, but useful and good enough. It’s also nice to have a fixed blade knife in the woods, particularly when starting fires. That’s because fixed blade knives make it easy to baton-cut kindling out of gathered wood. Just don’t expect an award winning EDC knife here. If you don’t want the built in fire starter, then no point in picking this one. For some, a knife just doesn’t cut it, so to speak. There are those among us who would rather take a multitool into the woods with them. And for good reason. A multitool can be incredibly useful around camp or for repairing gear or improvising in an emergency. Especially now that multitools are being manufactured at an unbelievable bar of quality. The Best Multi-Tool: Leatherman Skeletool Multitool is probably the best multitool for camping you can find today. It only weighs five ounces (less then some of the knives in this review!) and is home to seven tools. That’s less than an ounce per tool! All told, this gadget’s got a stainless steel combo blade, pliers, bit driver, removable pocket clip, and carabiner/bottle opener. 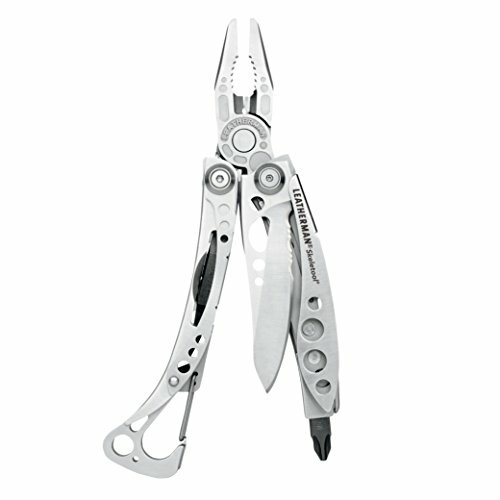 And unlike many of this tool’s predecessors, the Leatherman Skeletool looks good. Whether it’s tucked into your pocket, clipped to your pack, your doing work in your hand, this thing is sleek. Furthermore, it’s intuitive and safe to use. Smart and well honed design features ensure that all the parts fit together just right, no matter the configuration. There’s really nothing more to say, if you need more than just a blade, this is the obvious choice. I mean, a Victorinox Classic Swiss Army is a similar offering, but the honest truth is that it’s a child’s toy when compared to the Skeletool. If you have serious work to do, get a Leatherman. For many, backpacking with a flip-blade knife is just not their style. And it’s true, there are a lot of things you can do with a fixed blade knife when you’re camping that an EDC knife just can’t handle. And although we can’t go into all the best fixed blades for backpacking here (although, stay tuned for another buyer’s guide coming soon! 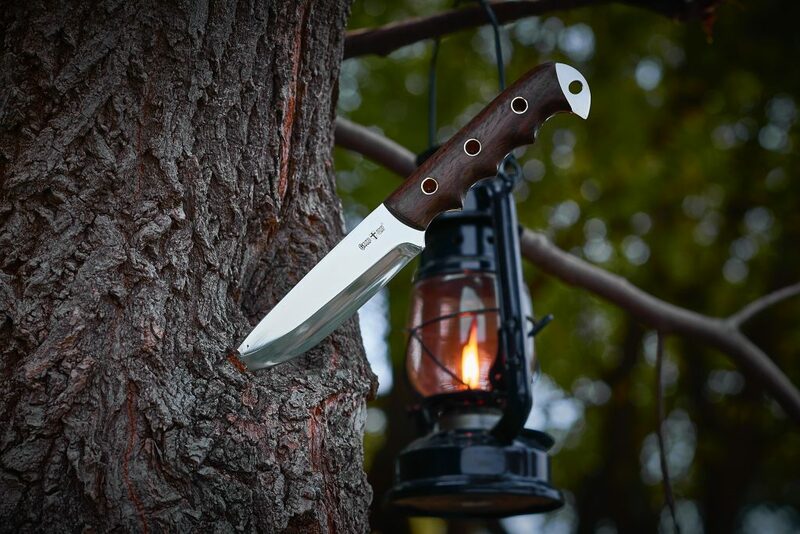 ), we can cover at least one of the best fixed blade camping knives around. Inspired by a classic Finnish Puukko, the Finn Hawk was designed by Andrew Demko to be an ‘every man’s’ Puukko. It’s edge is a simple, zero-grind that cuts well, but resharpens easily. A simple, sturdy sheath that lashes easily to your belt or pack as well as a convenient hole in the handle make it easy to pack this knife along for any type of adventure. Taking a good blade is just basic backcountry safety. You should never find yourself more than a couple hours from help without a reliable blade on hand. Why, you ask? Well, the reasons are many. Among them, cutting straps or lines if you get caught or stuck in an emergency and need to escape. Cutting kindling and starting fire is much easier with a knife. Even cutting cheese for dinner is next to impossible without a blade handy. That’s not to mention all the arguments that you may need it for self defense or hunting as well. All things considered, a sturdy knife is both one of the oldest, and most elemental parts of a good camping kit. The best backpacking knife is something any adventurer can’t do without. If you don’t have some sort of blade in your backpack already, you’re actually putting yourself at risk every time you go out unprepared. As we’ve already mentioned, and shown to some extent, there are a lot of types of knives to choose from. Not all of them flip from the handle like the average EDC knife. Fixed blades, multitools, and special survival knives all make great tools for camping and backpacking. Pocket folding knives are certainly the most popular types of knives these days. This includes all manner of low-profile, lightweight and stealth EDC blades. These are marked by lightweight, efficient hinges, locks, and deployment mechanisms. Some pocket knives have assisted flip opening mechanisms and others are all in the wrist. Most, but not all feature thumb studs for this. However, some knives have other mechanisms in addition to or in place of thumb studs. For a really great pocket knife or the best EDC pocket knife, you’ll have to invest at least $80. However, excellent pocket knives can come as cheap as twenty bucks. If you’re looking for a blade that carries well in all situations, then an EDC knife (or every day carry knife) is perfect for you. Best of all, they make a great carry in the city as well as in the woods. Multi-tools are all about versatility and functionality. Some are small and slip by, barely noticed, others are sturdy workhorses that aren’t shy about getting the job done. The trick to making the best multi-tool for camping and backpacking is keeping it light. When you pack ten tools into one, it’s easy for the weight to add up. Using lightweight designs and materials is critical to the best multi-tool. However, if you make a multi-tool too light, you risk it being too flimsy and falling apart under heavy use. After all, the whole point of a multi-tool is to get lots of tricky jobs done. You’ll find the basics usually, like a blade, screwdriver, bottle opener, can opener, scissors, nail file. Then you can also find other fun things like corkscrews, tweezers, toothpicks, auls, and other special tools. These days, there are some impressive multi-tools on the market. 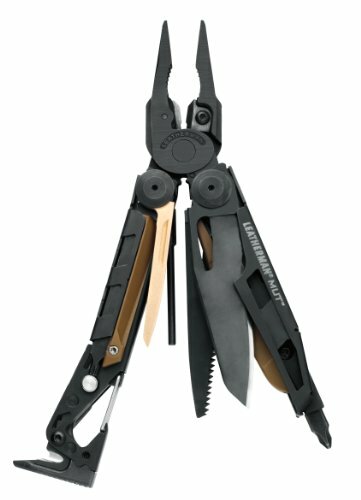 If you are a sucker for versatility or just a cool gadget, get a multi-tool. It won’t be the best at anything, but it’ll do a solid job on just about everything. The fixed blade sheath knife was once the most essential piece of equipment in every outdoor kit. Although it has taken a bit of a backseat role in the outdoor industry of modern times, it is still just as useful as it was a thousand years ago. The secret is in the spine. Because a fixed blade knife is made of a solid piece of steel, it provides unparalleled strength when compared to a flip knife. This lets you hammer on it, carve with it, and generally work it harder than a hinged-blade. If you’ve never taken a fixed blade knife camping, you have to give it a try. The reliability and versatility is well worth a little extra weight and size on the trail. The only drawback is that fixed blades are considerably different to carry in the city and are not permitted in all places. 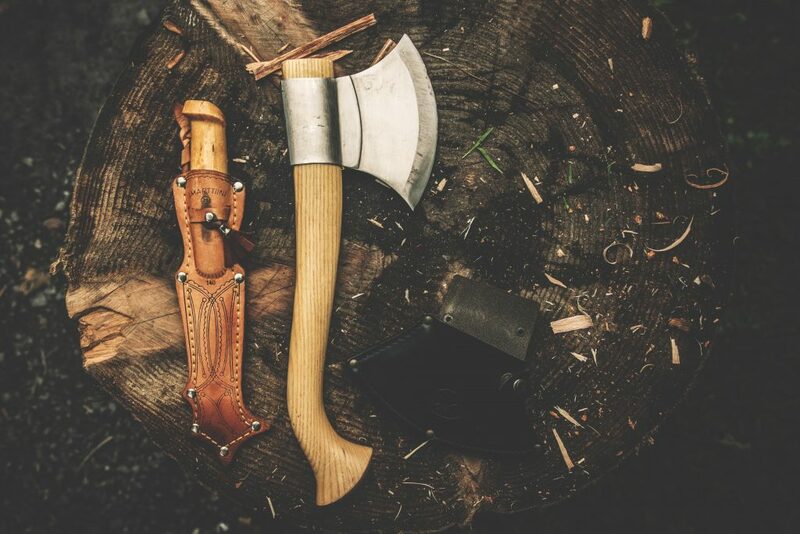 A survival knife is perfect for any minimalist, woodsman, or survivalist. If you’re the one headed into the woods with as little as possible for long periods, these are perfect. It’s not just the survivalist who needs one, if you just like to be prepared for the worst when you’re out in the woods, this is what it’s all about. Survival knives all include some form of fire starter. Some also come with other gizmos and gadgets to keep you safe in a survival situation. Just be sure that you aren’t buying a gimmick that’s going to give out after a couple of camping trips. The upside to buying a survival knife, is that they are mostly very affordable. It’s easy to pick one up and have it handy for your more serious endeavors but own another blade for casual conditions. If you’ve done much traveling, you’re probably familiar with neck pouches for money and passports. There’s a reason why it’s recommendable to keep such important things close to your chest. A neck knife follows the same principle. They are usually small, fixed blade knives designed for self defense and survival. Most don’t cost much but most also aren’t of outstanding quality either. If you choose a neck knife, it is probably because of your preference and not because it’s the highest quality or the most useful. If you think that around your neck would be a useful place to hang your knife, then do it. The best backpacking knife can be used for a wide variety of tasks. If all you needed it to do was cut cheese for your quesadillas, you could just take a butter knife. However, out in the woods, you’ll find a lot more to do with a solid blade. This is just a handful of the reasons you might need a knife in the woods. At different tasks, different knives will perform best. 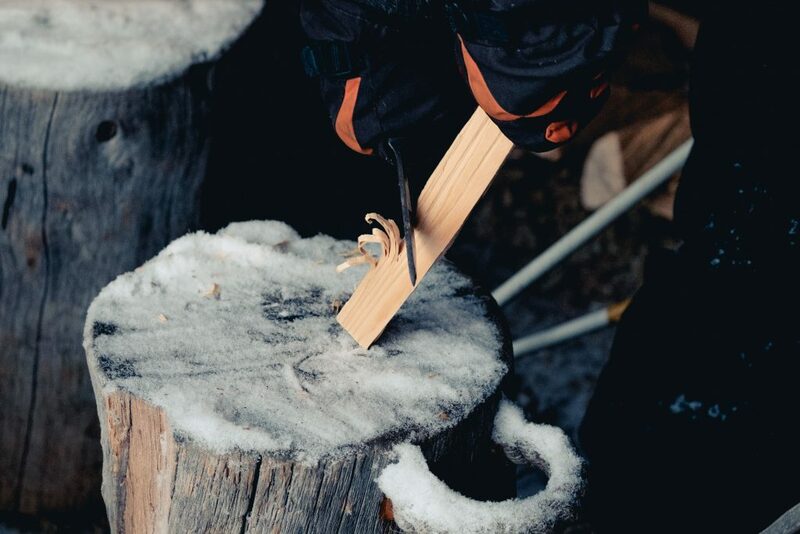 For working with wood or other hard materials, you’ll need a fixed blade or a really sturdy hinged knife. For first-aid, making tools, or modifying gear, a smaller pocket knife is often easier. A delicate blade is better fit to delicate tasks. Even better, a multi-tool might have functions you can’t do without. 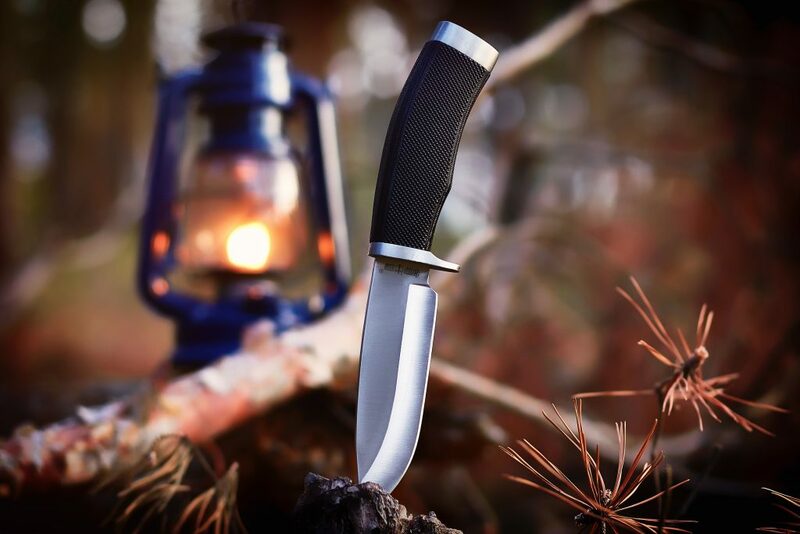 For uses like self-defense, survival, and emergency preparedness, survival knives and neck knives might be the best answer. It all depends on your own lifestyle and needs. If you’re still asking this question, you probably still have some decisions to make about how you want to backpack. First on your mind should be the size of your pack. Most people who are serious about backpacking carry at least a sixty liter pack. That’s plenty of room for all your gear, food, and clothing. Are you the type to pack light and do without some comforts? Or are you going prepared for everything? If you’re not taking the gear to start fires though, no need to take a fixed blade. Better to save the weight and stick to an easier blade to carry. But if you’re going to be processing wood, hunting animals, or engaging in any sort of bush-craft, then a fixed blade is a must. Along with the size and weight of your knife, you should consider how easily it lashes or clips to your pack or person. Many of the best backpacking knives come with sheaths that easily lash to your pack. EDC knives are all built with pocket clips and many have lanyard holes to hang your knife if you’d prefer. Contrary to popular belief, bigger is not always better. Especially when it comes to knives. In addition to being too heavy or too big, some knives just don’t fit smaller hands as well. Many people think that the lightweight trend is over the top and excessive. Maybe true. However, a lightweight EDC knife is great because it can clip to your person, no matter what you’re wearing without weighing you down too much. This is particularly nice for the fast and light like trailrunners, trekkers, and cyclists. Furthermore, some knives are so compact and lightweight that they make a good backup to a primary, larger knife. The bottom line is if your knife doesn’t fit in your pocket or the place you intend to carry it, it’s not worth much. It could be the best backpacking knife ever made but be worthless to you because it’s just inconvenient. So what size are the pockets you’re going to be putting your knife in? Where do you want to carry it? Test your new backpacking knife in the pockets of you favorite pairs of pants. Or if you intend to carry it in your pack, make sure it fits well in the small pockets where it would be convenient. Furthermore, your knife should be comfortable in your hand when it’s closed too, not just when it’s open. So make sure it’s weighted well and is easy to manipulate when it’s closed. If it fit’s your hands well, you’ll be able to easily control it as you open and close the blade. So much goes into the blade of your knife that there are volumes upon volumes of work about it. Humans have been refining blade technology since it’s invention. These days, they’ve gotten pretty damn good at it. We won’t try to cover everything there is to know about each steel and grind pattern, but let’s at least go over the basics of each feature of a blade. There are a lot of types of steel on the market these days. Companies have been working together for a while now to make some modern marvels of material engineering. The most important factor you should be concerned with when it comes to your steel is it’s carbon content. The more carbon, generally speaking, the better the edge you can create and hold. However, high carbon content also leaves a blade prone to rust and wear. Most steels offset these properties of carbon by adding other alloys and elements that increase hardness, wear resistance, and corrosion resistance. 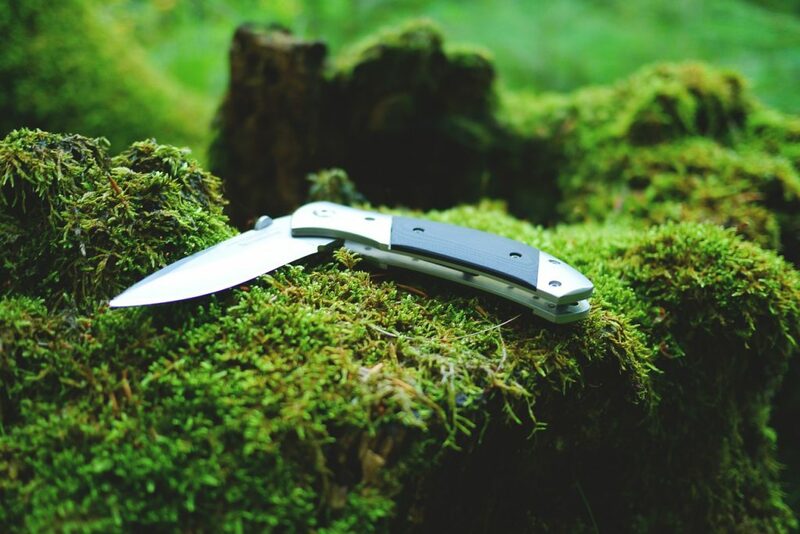 Some of the most common types of steel for the average backpacking knife are 420HC, Sandvik 12C27, Sandvik 14C18N, 440C, and 8Cr13MoV. If you buy the absolute best backpacking knife, it might be made with VG-10, or CPM-S30V/CPM-S35VN. Those may seem like some weird names. That’s because most of them denote the molecular structure of the steel. The grind of your edge is actually the edge itself. Different blade grinds form very different edges that perform differently for different tasks, sharpen, and hold an edge differently. It’s important to know a bit about your grind so that you can understand how to best use and care for your knife. Most knives these days, and certainly the best backpacking knife, is made with some sort of flat or compound-bevel flat grind. That’s because flat grinds are the easiest to sharpen in the field with a pocket knife sharpener. Their grind goes at a consistent angle to the edge. Flat grinds also can become quite sharp. There are many other grinds such as hollow, convex, and chisel grinds. These are found on some backpacking knives but are more often employed for specialty blades. Hollow grinds are make great skinning knives, for example and are featured on some Buck blades. Chisel grinds are popular for woodworking. Most of these grinds, though, are much harder to sharpen via conventional means. A grind with a compound bevel though, is more and more common these days because it cuts more easily and is more resistant to chipping then other edges. A compound bevel can be applied to any type of grind. If you hear the term Scandanavian grind, that is a type of flat grind very common among the best backpacking knives. The blade shape also has a big effect on your cuts. There are a ton of shapes marketed under different names, some are classics, others are modern tweaks for specific blades. For the most part, blades are named for the shape of their tip. The drop point, clip point, and Tanto point are all among the more common styles for backpacking knives. A blade performs based on it’s properties. A thin tip is good for piercing. 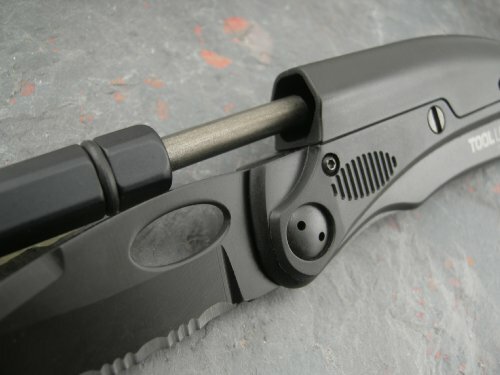 Combat knives generally feature a clip tip for this reason. A drop tip is the most standard and familiar tip and performs best at most average knifework. 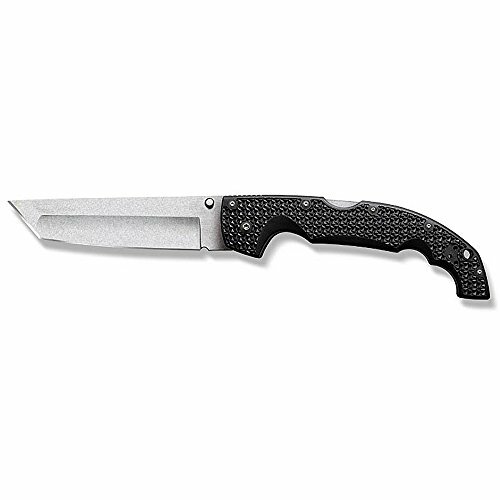 Tanto provides special angles that do a great job with specialized jobs, gear repair, or other specific cutting tasks. The wider and heavier the blade, the more power you can push through it. Lighter, thinner blades are better matched to a more delicate touch and lighter tasks. A lot of people buy their first knife without considering what size of blade they really want. How can you expect to find the best backpacking knife if you don’t have the right blade? You can’t. And what is the right blade? Well it depends on your lifestyle, environment, and body size. For me personally, about 3″ is great. In the city I prefer a delicate blade that’s a bit shorter, and in the woods I prefer a strong blade that’s a bit longer, like that on an Opinel No. 8. However,that’s a decision you’ll have to make for yourself. What size knives fit your hands best? What size jobs do you find yourself tackling in the backcountry? If it’s hard for you to think in these terms without a little context, then I suggest you start with a blade between 2.5″ and 3.25″. Use it for a while and see how it does with your own average cutting tasks. A knife this big will be long enough to slice cheese without getting it in the hinge. However, it won’t be so big as to feel clumsy or excessive. Although many people don’t think that the handle of a knife has much effect on it’s actual performance, you might think twice before you listen to them. After all, the handle is over half the knife. Not only that, but it’s the part you interface with, it’s where the blade connects to your body. A quality handle with a comfortable grip will make a blade feel like the best backpacking knife from the first moment you feel it. A flimsy handle will alert you of a gimmicky blade just as quickly. If you’re looking for the best backpacking knife, then you’ll probably wind up holding a G-10 or micarta handle. These are both synthetics that provide some of the best grip, durability, and feel. However, handle material is as much about preference as it is about performance. Many people prefer metal handles for a more serious feel. Others still prefer wood. Just make sure it’s real wood and it’s properly treated to last. Good examples of wooden handles come on many Buck knives as well as the Opinel No. 8. If your handle is made out of a flimsy-feeling material, it doesn’t necessarily mean the blade is bogus. 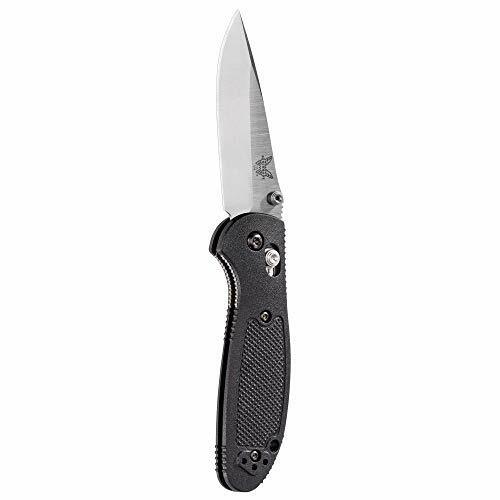 For example, the Benchmade Griptilian comes standard with what many consider to be a sub-par plastic. Technically, it’s called Valox, and it’s designed to be strong and very lightweight. Even though the handle feels a bit lackluster, the knife is a hot contender for the best backpacking knife at a moderate price. It is certainly one of the most popular. Many knives, the Griptilian included, offer the option of swapping things like handle material, blade steel, and shape. 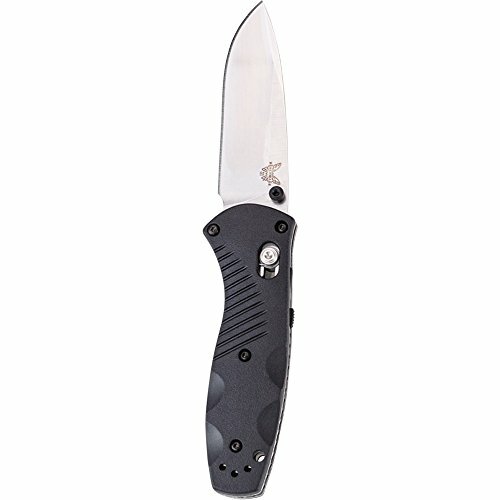 The Griptilian can be purchased, for a bit more money, with a G-10 handle. If you hold one of these, you’ll immediately feel you’ve found the world’s best backpacking knife. If you haven’t picked up on it so far, the best backpacking knife for you is a very personal thing. It reflects your personality, your lifestyle, even your body-type. A knife that is functional is a knife that is well fit to the tasks you use it for. That’s why many knife aficionados will keep a whole collection. Each knife is specialized for certain tasks. For the backpacker, functionality takes on a whole new level of importance, though. That’s because you can’t carry your entire knife collection with you on the trail, even if you have one. Choosing just one blade to be the best at all your tasks is no easy feat. The best backpacking knife needs to be durable enough to take on tough tasks. However, too big and it will become inconvenient to carry. Often overlooked, your knife also needs to be easy to sharpen in a pinch. Trail work can often put a damper on even the best of edges. Yet, the best backpacking knife needs to be ready to cut a tomato for dinner and that’s going to take a fine edge. Refer to the section about blade grinds to learn more about edge retention. How you carry your knife can make all the difference when it comes to utility and functionality. If it’s tucked away in your pack, you’re not likely to get it out nearly as often. When you do, it’s going to be a hassle. The best way to carry your knife is where it is ready at hand, yet unobtrusively tucked away. These days, most EDC knives come with reversible pocket clips that support left or right handed carry. Some can even be positioned tip up or tip down. That mostly makes a difference if you’re concerned with a fast draw in a combat or survival situation. Not so important when you’re backpacking. One thing to be careful of if you keep your knife in your pocket is that many knives can scratch up a screen pretty quickly. Don’t put your phone or other important gadgets in the same pocket or they might get ruffed up. Particularly if your knife has a metal handle. Another great option for backcountry blade carrying is lashing your blade to your backpack or person. This only works with fixed blade knives, but can be a great way to secure it out of the way. I typically travel with a bigger fixed blade lashed to my pack and a small EDC knife in my pocket. We’ve touched on some of the extra features to be found in the best backpacking knives. Multi-tools and survival knives both make great examples of how a knife can offer more. However, that’s just the tip of the iceberg. Over the years, a lot of companies have tried many innovations. Among the more successful are built in tinder-boxes, distress beacons, survival whistles, bear spray, and flashlights. Not all knives with such extra features are of high quality, but a good knife outfitted with bear spray is the best backpacking knife for bear country. In general, you’ll have to look pretty hard to find a high quality blade that is also packed with auxiliary features. For the most part, these are gimmicks and should be purchased with caution. Do your research carefully, and first try to find reviews of any knife with unfamiliar features. Chances are that if it’s a piece of junk, someone will have gone before you and exposed the knife for what it is. Essentially, what everyone wants to know when they go out in search of the best backpacking knife, is which one is the best value. Most people don’t actually want the very best backpacking knife because they aren’t prepared to pay that much money. This would be a very short review if that’s all there was to it. Instead, finding the best value is about balance. You need to balance your desire for quality with the limitations of your budget. Your desire for a big blade with your need for a convenient carry. The best value, I always say, is composed of three parts. And you should consider them in this order. Using these three criteria, you can eliminate most products from your search and hone in on the few that you really want. Do you like the knife? Does it have the features you want? How does it feel in your hand? Was it love at first sight? This will say a lot about how your relationship with your knife will endure over time. 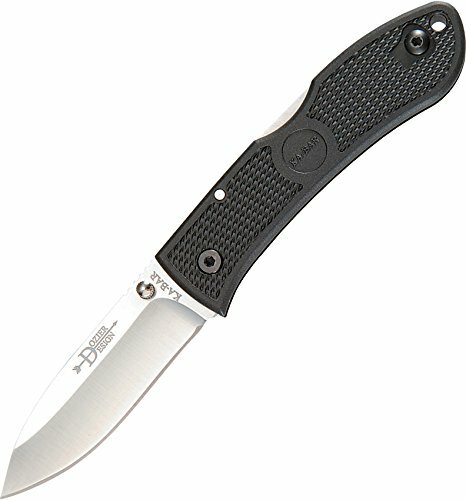 Is the knife durable and sturdy? Was it made to be here for a good time or a long time? The best backpacking knife will be made for both. Quality craftsmanship and a reputation for longevity are signs that your purchase won’t be shortsighted. Once you have used the first two criteria to hone in on just a few products that match your desires and will last a long time, then you should consider the cost. Only worry about the money at the end, though. If you dismiss a knife because it costs too much off the bat, you may miss out on what would have been the best backpacking knife for you. Think about features first and then compare prices. So we’ve done it. We’ve gone through just about everything there is to know about finding the best backpacking knife. Now you know about the top twenty three products on the market. You know about steel, grinds, hinges, handles, locks, flippers, even full on multi-tools. We’ve covered it all. There’s certainly more to learn, and if you’re feeling inspired I would encourage you to look up more details about blade steel, edge design, and the history of the quest to make the best backpacking knife. There’s always more to learn. And by now it’s probably clear, that the more you know about knives, the more you’re able to see which one’s are right for you, which ones are gimmicks, and which ones are just not your style. If you learn to recognize these differences, you’re ready to start your own collection of steel. I suggest you start with a mid-grade knife. Remember that the best backpacking knife is not always the most expensive. Dip your toes in about $80 deep and get something like a Griptillian or a Spyderco. That will let you make some important personal decisions about your own favorite style. 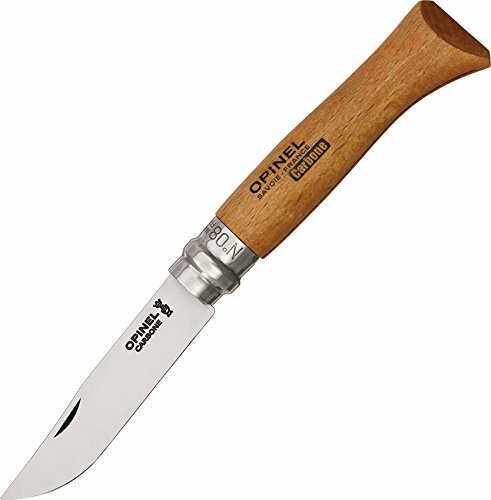 In addition, you might pick up a budget blade such as an Opinel. After all, it hardly costs a thing. Later on, if you’re gripped, you can think about investing more money in another, better blade. There’s just no need to jump into the deep end right away, unless that’s your style. Hopefully we’ve answered all the questions you came with and we’ve inspired some new ones that will keep you learning. There’s a lot to know.